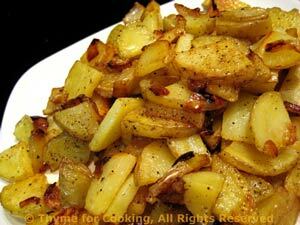 Sautéed Potatoes and Onions, Thyme for Cooking easy side dish. A simple dish but so easy and full of flavor; cooking doesn't have to be complicated! Sauté onion in oil in nonstick skillet over medium heat until just transparent. Add garlic and sauté a minute longer. Meanwhile, slice the potatoes - the long way, first in half, then in half again. Now slice (the short way) about 1/4 inch thick. We are aiming for bite size so if you have a huge potato, adjust accordingly. Remove onions & garlic from pan and add potatoes - with a drop more oil if needed. Sauté potatoes until light brown, stirring and flipping as needed. Continue to sauté until onions start to brown and potatoes are cooked through (taste one) and well browned.